BlackBerry still leads US smartphone market | BlackBerry Blast! 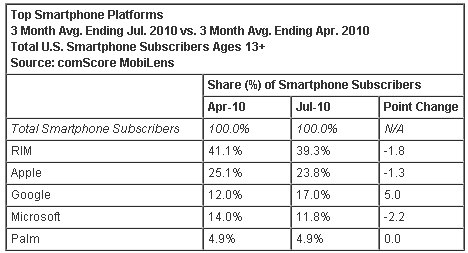 According to comScore, who just released data from the comScore MobiLens service, RIM is still in the lead of smartphones in the US. Of course, their market share has been dropping and continues to drop, but they're still in the lead. The report ranked the leading mobile original equipment manufacturers (OEMs) and smartphone operating system (OS) platforms in the U.S. according to their share current mobile subscribers age 13 and older, and reviewed the most popular activities and content accessed via the subscriber�s primary mobile phone. The July report found Samsung to be the top handset manufacturer overall with 23.1 percent market share, while RIM led among smartphone platforms with 39.9 percent market share. 53.4 million people in the U.S. owned smartphones during the three months ending in July, up 11 percent from the corresponding April period.